Smiling Shamrock Creative House — 85% of my painters are Beginners! Try it! Have an On-Site Business Paint Party or an In-Home Paint Party! 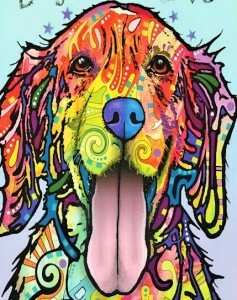 Over 80 Paintings to Choose from! put their own flair and signature to their painting. All of the kids had a ball and were so proud to show off their beautiful artwork. It was so nice to have you come to our library to do an art based program like this, I hope to have you back again sometime in the future. What a wonderful service you provided for the children of our community. THANK YOU !! I never know what to get my wife for Valentine’s Day. Someone recommended Smiling Shamrock for a couple’s night out painting event. My wife has some artistic ability so I thought she might like it. I was a little apprehensive because I have no artistic ability. For lack of a better gift, I decided to do it. Went very well. Instructor adapts very well to individual talent so my finished product didn’t look like a kindergarten project. It was a fun and different experience for us. Glad I signed us up. My friends and I have attended three classes (the most recent in the new studio), and everyone LOVED them. Peg encourages you and helps when requested. 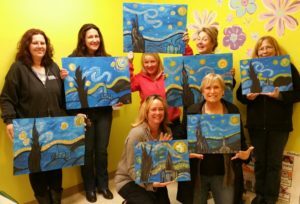 It’s a great social event with lots of giggles and some pretty good canvas paintings. Already looking to schedule another party. I only wish Smiling Shamrock was around when our children were younger for birthday parties. IT’S FUN!!!! I went to Smiling Shamrock Creative House with my daughter and girlfriends. We had a great time and Peg is a blast! We will definitely will go back! 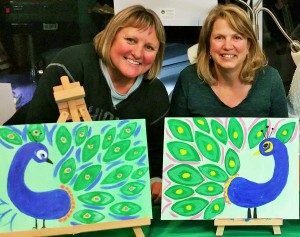 I have been to the Smiling Shamrock creative house several times , I have been on a girls night out..wine,appetizers, and creating art.. I have also been with my son who loves to paint, Peg makes it easy and fun! I look forward to going back and I highly recommend this place. The owner was a hoot, so easy to get along with. It’s a great experience to get together with friends and have fun! Highly recommend it!! Smiling Shamrock Creative House is absolutely inviting and adorable inside! Offering up a safe, enjoying and fun place to relax and let your creative being unleash! The owner Peg does a great job teaching and offers plenty of different varieties to paint. Time well spent. I’ve done several art projects here and had a blast! 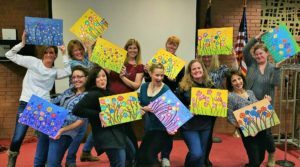 Great opportunity to get together with girlfriends while having fun painting. I have attended painting with Peg at the Smiling Shamrock three times, and I can’t wait to go again! 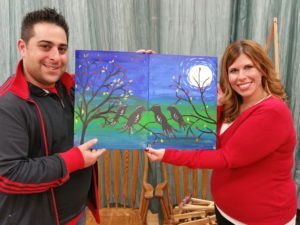 Each class had some regulars and new painters…all of whom thoroughly enjoyed the experience. The instructor is patient and accommodating (particularly with folks like me with no creative ability, whatsoever). Her new facility is large and inviting. Each visit has been a fun and enjoyable. She has had so many of the children in our area for classes, too. The word is spreading about this awesome experience, so set a date ahead of time and enjoy!